Airborne Brigade Leaders Prove Prowess In Alpine Passage - USA Patriotism! Leaders from across the 173rd Airborne Brigade came together December 10-12, 2018 to experience rigorous professional development and build interoperability with Italian allies while rucking to the summit of snow covered Monte Tonale in Northern Italy. 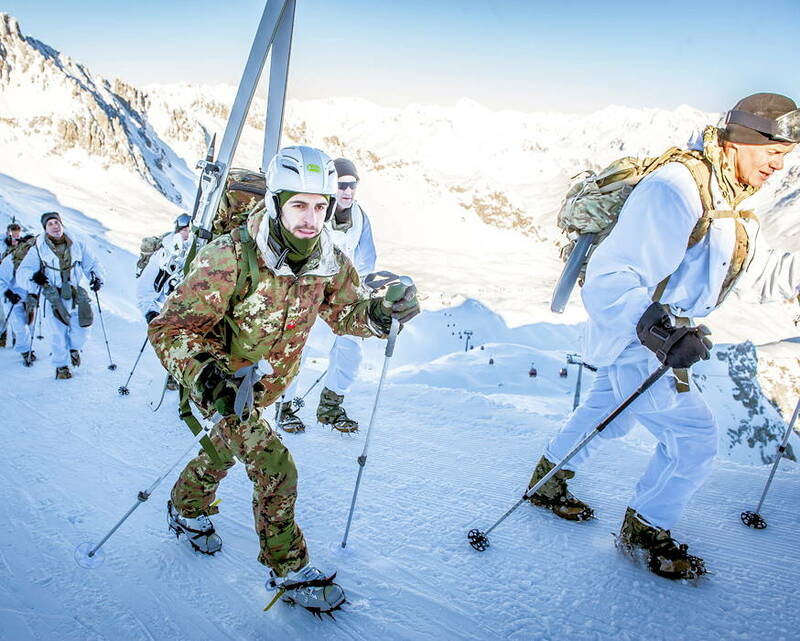 For exercise “Alpini Climb”, the brigade’s company commanders and first sergeants, as well as the battalion commanders and sergeants major teamed with Italy’s mountain warfare experts, the Alpini, for instruction in cold weather operations and field craft. The instruction was put to the test with a platoon sized patrol up to summit the mountain. December 11, 2018 - U.S. Army 173rd Airborne Brigade leaders with a rucks on their backs and snow shoes on their feet follow guides from the Alpini Julia Brigade on the snow covered Monte Tonale with the Dolomites mountain range in the background located in the Lombardy region of northern Italy. The 173rd Airborne Brigade is the U.S. Army’s Contingency Response Force in Europe, providing rapidly deployable forces to the United States Europe, Africa and Central Commands areas of responsibilities. Forward deployed across Italy and Germany, the brigade routinely trains alongside NATO allies and partners to build partnerships and strengthen the alliance. As part of the training, the participants surrendered their ranks along with their mobile phones and became members of a temporary platoon. The process allowed these dedicated leaders of the companies of the brigade to focus, however briefly, on the tasks ahead of them which would be rigorous. At the Alpini base camp, the Paratroopers received instruction on proper use of their arctic equipment, and techniques for trekking up the mountain. Additionally, they received instruction on how to build the “trunne”, Italian for a fox-hole in the snow, and what these intrepid Paratroopers would sleep in the following night. After departing the base camp on Tuesday, the Paratroopers marched up the snow covered mountain, with guides from the Alpini Julia Brigade, a ruck on their back, and snow shoes on their feet. “We all feel ourselves to be very physically fit, but traversing this mountain was a smoker,” said Cpt. Andrew Williams, commander of Headquarters and Headquarters Company, 54th Brigade Engineer Battalion. “Along the way we’ve had invaluable training opportunities in survival, how to sleep in the snow and things like layering” of clothing and the critical value of not sweating, continued Williams. After reaching the stopping point for the first night, the Paratroopers dug their buddy-team trunna and got a few hours of much needed rest to prepare for their final climb of the mountain on Wednesday morning. At the summit, the platoon was able to witness first-hand the view that their Italian and Austrian predecessors saw over a century ago when those two Armies met in these mountains as each nation vied for the dominance of northern Italy during World War I. In all, the exercise was a valuable experience for the participants. These paratroopers were challenged to perform and excel in an extreme environment. But more than that, they were able to do it as a team and with allies, which besides the training, was the whole point of the exercise. “One of the things we’ve stressed is teamwork. It’s absolutely critical that we all work together as a team and ensure that everyone makes it up as a team,” said Williams. After summiting the mountain, and reveling in the view, the Paratrooper leaders reformed and gingerly moved back to the base of the mountain. While many of these troops may never again be subject to mountain warfare or operating in full kit at below zero temperatures, the experience proves that Sky Soldiers will always achieve their mission weather jumping from 1,000 feet, or climbing their way past that same height.